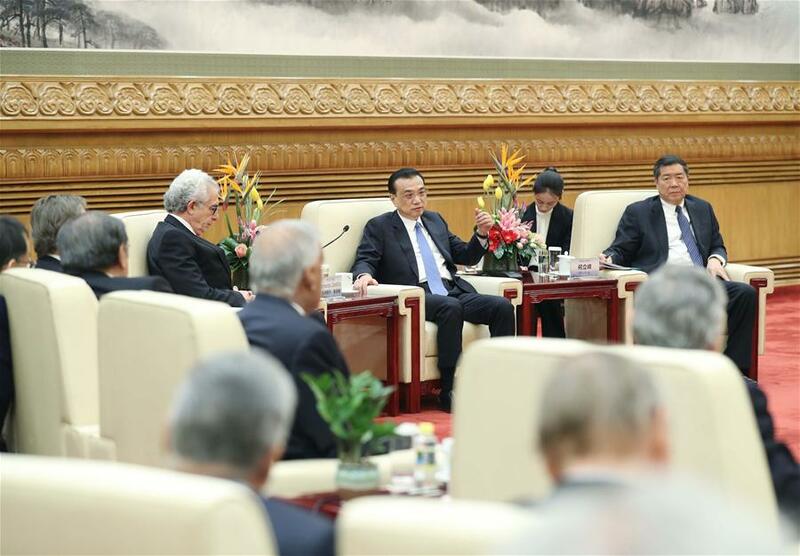 BEIJING, Dec. 17 (Xinhua) -- Chinese Premier Li Keqiang on Monday met with delegates attending the third Understanding China Conference, pledging to press ahead with reform and opening up. After listening to the speeches of former Mexican President Ernesto Zedillo, former British Prime Minister Gordon Brown, former Prime Minister of Denmark Helle Thorning-Schmidt, former Greek Prime Minister George Papandreou and former Director-General of the World Trade Organization Pascal Lamy, Li answered their questions and gave his opinions. Li said he appreciated the delegates' efforts to promote China's exchanges with the world. He said this year coincided with the 40th anniversary of China's reform and opening up. Over the past 40 years, China has achieved remarkable development progress, which was underscored by the Chinese people's hard work. "China's past achievements were realized by the reform and opening up, and future progress can only be made by further reform and opening up," he said. China will continue to deepen reforms, further press ahead the opening up, and commit itself to developing an open economy at higher level, he said, reiterating China's stance to create a fair business environment for domestic and foreign companies, and strictly protect intellectual property rights. "China has the conditions and ability to cope with various risks and challenges, and promote its economy to achieve high-quality development," Li said. The Chinese premier said that under the complex international situation, people should adhere to multilateralism and free trade, while treating problems in globalization and world trade from a development perspective. China supports the reform and improvement of the WTO rules, Li said, urging for relevant reforms to be conducted while making rules that "stick to the general direction of trade liberalization, accommodate all parties' concerns and interests, safeguard the development rights of developing members, and facilitate the narrowing of the North-South gap." Stressing that China would be a developing country for a long period, Li called on the world to understand more about a true China, hoping the delegates could be a bridge of communication and cooperation between China and the world, and make greater contributions to the common development of China and the world. The delegates congratulated China on its achievements in various fields such as economic development, poverty relief and education, saying all countries should work together to promote the reform and improvement of global rules, safeguard multilateralism and free trade. The three-day conference, which kicked off on Dec. 16, gathered nearly 600 people, including 40 global politicians, strategists and entrepreneurs.